The Short Version: The irony of social media is that a person can have hundreds of friends and followers online and yet not be able to find a date in the real world. SparkStarter seeks to change that. Launched in 2015, this dynamic matchmaking app turns your social network into your wingman and removes the guesswork from swiping for a blind date. Based in Minneapolis, SparkStarter operates on the premise that singles connect more authentically when they meet through someone they know and trust. The free app encourages users to play matchmaker and pair their friends by essentially saying “Hey, I think this person would be good for you.” Having a mutual friend to make the introduction gives the date more credibility, which increases the likelihood of its success. With such an ingenious and engaging interface, SparkStarter helps online daters make a long-term match that meets with their friends’ approval. My college roommate met my twin brother in our sophomore year and fell in love with him. Which worked out pretty perfectly for our family. Ever since, she has been eager to return the favor and fix me up with anyone she can find in her Facebook friends. A few weeks after her engagement, my soon-to-be sister-in-law showed me some pictures of a nerdy guy she worked with and asked if I thought he was cute. I did. Lo and behold, he was sitting at my table at her wedding reception. I politely pretended I didn’t know his name, age, religion, and dog’s name. We danced together all night and dated for a few months after that. My sister-in-law was over the moon with joy. When you meet a love interest through a good friend (or a relative), you have a strong personal endorsement to back your feelings, which can often make affection blossom that much quicker. 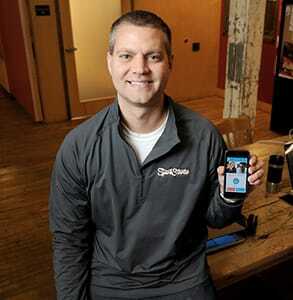 That intuitive dating truth inspired SparkStarter, a matchmaking dating app, to launch in Minneapolis in 2015. This revolutionary app uses your friend network to hook you up with a compatible date. The algorithm relies primarily on personal endorsements to recommend matches between friends of friends. Anyone can sign up for free and find dates for themselves or suggest dates for their friends. On SparkStarter, you can empower your friends and family members to find you a good date. Whether you’re looking for dates for yourself or for someone you know, SparkStarter offers a friendly platform to build natural connections. Growing steadily in Minnesota, the free app has over 50,000 downloads and expects to expand into more cities in the coming years. In 2009, Tony was 27 years old, single, and having a tough time with dating. One night, he vented to his friend Josh about all his romantic frustrations. Basically, he didn’t like the bar scene, felt uncomfortable with online dating, and wished there were a better way to meet women. SparkStarter CEO Tony Kramer met his wife thanks to a friend’s recommendation. Josh didn’t just listen; he took action. He logged in to his Facebook account to see if he could find someone who would be a good fit for Tony. After combing through his friends list for single women, he saw family friend named Astyn. They were both athletes, both from small towns, and both available. Josh thought it was a perfect match, so he mentioned Tony to Astyn and vice versa to get things going. The two actually bumped into each other later that week, and three years later, they got married. His triumphant love story inspired him to create a dating tool that would help friends of friends connect, make a date, and fall in love like he did. SparkStarter has all the traditional features of a dating app — you swipe through compatible singles and start communicating when you spark with someone in a mutual match. What makes the app different is the addition of matchmaking friends playing Cupid on the app and giving their seal of approval to particular pairings. 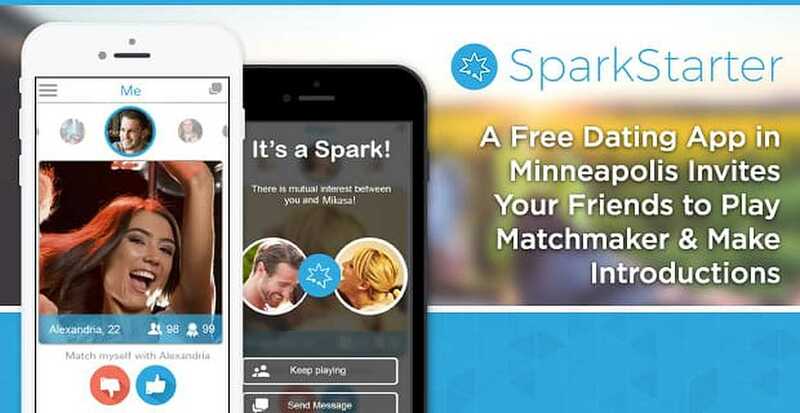 This Minneapolis-based app activates a user’s Facebook friends to make smarter matches. It’s a fun and effective way to bring people together for romance. The target audience for the app are millennials in their mid-20s, fresh out of school, with untapped dating potential in their social networks. You can swipe through date prospects for yourself, or you can select a friend’s profile and swipe through people on their behalf. According to internal statistics, 54% of users decide to play matchmaker on SparkStarter. When a matchmaker suggests a date, both users receive a notification and can then choose to make it a match. Online endorsements build trust between users on SparkStarter. Your friends can make a comment about a match or endorse your particular interests or qualities. So it’s not just you saying “Yeah, I’m totally generous” on your profile. On SparkStarter, date prospects benefit from getting a second opinion from someone who knows you well and can attest to your good qualities. SparkStarter is a socially powered dating app, so the more friends you have, the more matches you’ll receive, and the more active you are, the better your experience will be. The algorithm learns from each date endorsement and uses that information to target compatible date prospects in your area. Tony described SparkStarter as a lean and mean machine on a mission to change the way online dating connects singles to one another. A team of 15 people work together to develop responsive, user-friendly features and spread the word about SparkStarter’s unique premise. Based in Minneapolis, the SparkStarter team works hard to build effective dating tools. The passionate team is always brainstorming new ideas to streamline the dating experience and inject a little fun into people’s love lives. Currently, the team is focused on expanding the app’s reach beyond its home in Minneapolis and into other cities, including New York and Los Angeles. The trick, of course, is growing the user base organically and making sure the social networks are robust enough to support singles across the country. 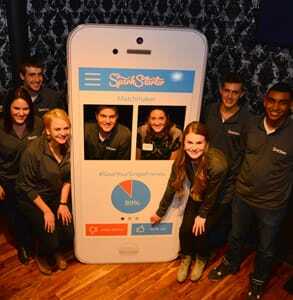 SparkStarter seeks to take mobile dating by storm by encouraging friends to join together to make a match. Whether you’re single or attached, this platform gives people a leg up in the love department. I was overjoyed to have a front-row seat to my brother’s love story and to know I had a hand in helping their relationship get started. When my sister-in-law tries to “pay me back” by setting me up with her friends, I happily go along with it because I trust her judgment about people. Plus, it’s just convenient when an attractive guy is served to me on a platter. SparkStarter allows matchmaking friends to put their social connections to good use and pair up romantic relationships online. With simple swiping features, the app empowers people to bring more love into the world and make dating a more friendly experience.